Running to Keep Up | Does This Font Make Me Look Fat? Laura had the brilliant idea of putting an ad for The Santa Diaries in Spotlight, the newsletter published by the American Association of Community Theatre. She designed the color ad and got it in just under the deadline. Darlene DeLorenzo who coordinates AACT Vendor/Festival Services got us a great location in the newsletter. The newsletter hit people’s mailboxes by the end of February, a few days earlier than we expected. We were barely ready with the tweaks we’d been making to the script when the first emails came in requesting a perusal script. If any of these requests are interested in purchasing the script package we have to be ready; we’re still running, but almost there. One of the best parts of collaboration is that we get things done. This weekend Laura was in her office putting together information to go with the script. She’d added some photos from both productions. She emailed me that she needed a photo of one of the Christmas parades we’d walked in carrying a Santa Diaries banner. I had one, actually knew where to find it, and emailed it to her. 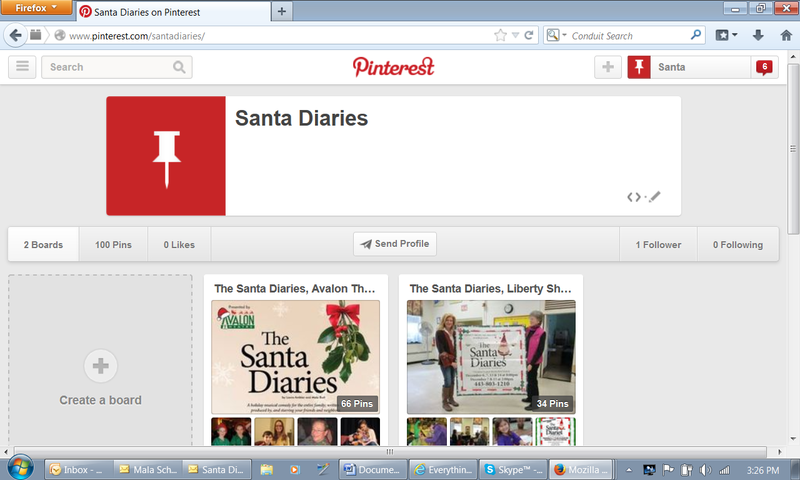 I knew where it was because I’d opened a Pinterest account for Santa Diaries and made a board of the photographs that I had for each production. If you have photos, feel free to add them to the boards. We’ll have the sales package together in the next two days and then we can go back to working on The Santa Diaries movie script. We had to set that aside to make sure we were ready when somebody wants to buy the play script. We’ve got our running shoes on. This entry was posted in Christmas, Laura Ambler, Mala Burt, Pinterest, Script Writing, The Santa Diaries Movie, The Santa Diaries Play, Uncategorized, Writing, Writing Resources, Writing Tips and tagged Laura Ambler, Mala Burt, The Santa Diaries play by Mala Burt. Bookmark the permalink.